This article is an analysis of the success ratio of the films in which the Top 7 stars of India have appeared in since 2000. Only the films where these actors had a ‘substantial’ or ‘significant’ role where accounted for. Special appearances where the star had limited screen time aren’t included. We have slightly tweaked the analysis from last time to include films with ‘Above Average’ and ‘Semi-Hit’ under the ‘successful film’ category. We start off with Aamir Khan, one of the most successful actors in recent times. Failures: Mela (flop), Dil Chahta Hai (average – was a decent success only in select cities), Mangal Pandey (below average). Successes: Lagaan (hit), Fanaa (super hit), Rang De Basanti (hit), Taare Zameen Par (super hit), Ghajini (All time blockbuster), 3 Idiots (All time blockbuster), Dhobi Ghat (semi hit), Talaash (semi hit) and Dhoom 3 (All Time Blockbuster). Total successes: 9. Aamir Khan has featured in 12 films in the last 14 years, out of which 9 films have been successful. Dil Chahta Hai, one of his best films, was an average grosser at the box office, even though the general belief is that the film was a huge success. Aamir’s last failure was Mangal Pandey in 2005, after which every single film of his has recovered its investment. 3 Idiots and Dhoom 3 are his biggest money-spinners to date. Ajay wasn’t a commercially successful actor until he started working in comedy films. His partnership with director Rohit Shetty has helped push a terrific actor like Ajay into the big league. However, his overall success ratio is quite poor at 26.5 percent. Only 1 in 4 films of the actor have gone on to be successful at the box office. He has films like Singham 2 and Action Jackson coming up. Both are likely to rake in the moolah at the ticket window and hopefully increase his success ratio too. Failures: Hera Pheri (average), Dhadkan (average), Khiladi 420 (flop), Ek Rishtaa (below average), Ajnabee (average), Haan Maine Bhi Pyaar Kiya (flop), Aankhen (average), Talaash (flop), Khakee (average), Police Force: An Inside Story (flop), Aan (flop), Meri Biwi Ka Jawaab Nahin (flop), Hatya: The Murder (flop), Aitraaz (average), Ab Tumhare Hawale Waton Saathiyon (flop), Insan (flop), Bewafaa (below average), Deewana Huye Paagal (flop), Dosti: Friends Forever (below average), Mere Jeevan Saathi (flop), Humko Deewana Kar Gaye (flop), Jaan-E-Mann (flop), Tashan (below average), Chandni Chowk to China (flop), 8 X 10 Tasveer (flop), Blue (below average), Khatta Meetha (below average), Action Replayy (flop), Patiala House (below average), Thank You (average), Desi Boyz (below average), Joker (flop), Khiladi 786 (average), Once Upon A Time In Mumbaai Dobaara (flop), Boss (flop). Successes: Awara Paagal Deewana (above average), Andaaz (hit), Waqt (above average), Garam Masala (semi hit), Mujhse Shaadi Karoge (hit), Phir Hera Pheri (super hit), Bhagam Bhag (hit), Namastey London (hit), Heyy Babyy (hit), Bhool Bhulaiyaa (hit), Welcome (blockbuster), Singh Is Kinng (super hit), Kambakkht Ishq (above average), De Dana Dan (above average), Housefull (hit), Tees Maar Khan (semi hit), Housefull 2 (super hit), Rowdy Rathore (blockbuster), OMG! Oh My God (super hit), Special 26 (hit). Akshay has featured in 54 films in the last 14 years, which is an average of close to 4 films every year! He is probably the only top star in the industry, who puts his superstardom on the line multiple times every year and yet maintains a healthy success ratio of 35% i.e one in 3 Akshay Kumar films work at the box office. 2007 was the turning point in his career, he gave 4 hits in a single year and was considered to be the biggest crowd -puller in the industry. His career has gone through ups and downs, 2013 wasn’t a great year for him, but he has quite a few promising films lined up for release in 2014. Failures: Fiza (flop), Yaadein (flop), Aap Mujhe Achche Lagne Lage (flop), Na Tum Jaano Na Hum (flop), Mujhse Dosti Katroge (flop), Main Prem Ki Diwani Hoon (flop), Lakshya (below average), Kites (flop), Guzaarish (flop). Successes: Kaho Naa.. Pyaar Hai (blockbuster), Mission Kashmir (semi hit), Kabhi Khushi Kabhie Gham (blockbuster), Koi.. Mil Gaya (blockbuster), Krrish (blockbuster), Dhoom 2 (blockbuster), Jodhaa Akbar (hit), Zindagi Na Milegi Dobara (hit), Agneepath (hit), Krrish 3 (All Time Blockbuster). Hrithik’s debut film was the biggest grosser of 2000, but most of his films that followed failed to make a mark. Post Koi Mil Gaya, Hrithik has been choosy and has consistently delivered some huge grossers. 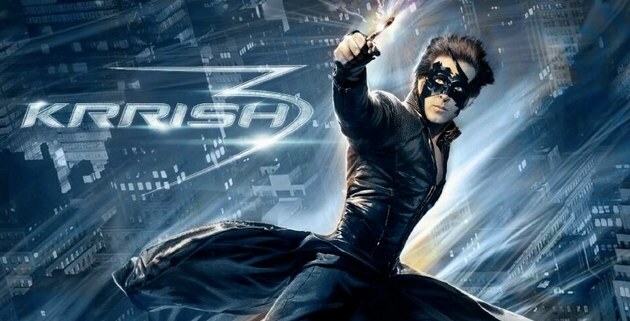 2006 was the biggest year of his career, as two of his films Krrish and Dhoom 2 were the biggest grossers of the year. In the last 10 years, 7 of his 9 films have worked at the box office. Overall, his success ratio is pretty good and should only improve from here on. Salman’s glorious run that included 5 back-to-back blockbusters came to an end this year with Jai Ho. His winning streak of box office money-spinners was probably the best since Rajesh Khanna’s 15 continuous hits record. Even though Salman has consistently featured in 2 movies a year, his success ratio is very good at around 45%. Even though SRK has appeared in as many as 25 films in the given time period, his success rate is only comparable to Aamir Khan, who is on-par with SRK but has less than half the number of film releases. While many will argue that Ra.One wasn’t a clean hit at the box office, but the fact remains that it was declared a hit by the trade even though a few distributors lost money. SRK’s consistency is even more amazing since his last failure was almost 9 years back in 2005. However, when it comes to big box office blockbusters, SRK is behind Salman, Aamir who have consistently delivered huge grossers in the last 4 years or so. In the overall list of highest blockbusters, he is behind Hrithik. Failures – Saawariya (disaster), Rocket Singh (flop), Anjaana Anjaani (Average), Besharam (Flop). Successes – Bachna Ae Haseeno (semi hit), Wake Up Sid (semi hit), Ajab Prem Ki Gazab Kahaani (super hit), Rajneeti (blockbuster), Rockstar (semi hit), Barfi (super hit), Yeh Jawaani Hai Deewani (blockbuster). The new superstar on the block, Ranbir Kapoor, has already started giving 150 crore+ grossers at the box office. He has age on his side and he is also considered to be one of the best actors in the country. With every top director wanting to sign him for a film, Ranbir could soon enter Aamir – SRK territory. He already had a very good success ratio of around 64%. Once Upon A Time In Mumbai Again and Boss which did not click. which got good appreciation from critics and the Punjabi movie Bhajii again appreciated widely. Income Tax Paying celebrity, in the last few years. I am Swiss and I live in Geneva. The only Indian actor European people sees and respects is Akshay. Khans are too ugly no one wants to see them as leading actors, only they look like badmashs.antiwues. *Rab Ne Bana Di Jodi. There Are Total 15 Blockbusters Till Now In Bollywood…. SRK Has 10 All Time Blockbusters Out Of 13 ATBBs. Without SRK,Only 3 ATBBs In Bollywood. Blockbusters+All Time Blockbusters=15+13=28 Blockbusters Including All Time Blockbusters. SRK Has 17 Blockbusters Out Of 28 Blockbusters. Because only Indian especially Muslims watch srk. In the west people laugh at him, he looks like badmassh. Horrible monotonous and antipatitic actor. If he acts in Hollywood , people will run away from theatres.keep him there please. Great analysis but somehow the # of films each actor has done has to be taken into consideration as well. Aamir with only 12 movies isn’t a great comparison b/c he has clearly taken less risks and has played it super safe than those that have done 25+ movies since 2000. Face to face competition between SRK and salman can be made bc the difference is only about 6 movies and SRK clearly emerges a winner hands down! At the end of the day, its the profitability and consistency that matters, not necessarily how many blockbusters or highest grossers you’ve given. And if anybody takes into worldwide collections since 2000, SRK would blow all the other actors out of sight. so it clearly shows who’s the baadshah of bollywood… srk rocks..
Chalte chalte is hit not semi hit. Tere naam is semi hit not above average. Jodha akbar is semi hit not clean hit. Salman Khan also has 5 BBs in 4 years. ATBBs and BBs are true indicators of stardom. SRK on the other hand failed to give 1 ATBB in the last 15 years. @Indicine Where is Aamir’s Raja Hindustani,which was All Time Blockbuster.So,Please correct your Ranking. @indicine, Krrish3, Chennai Express were not ATBB, check BOI. These verdicts are wrong. We salman fans have created ‘salman Bhai (virgin)’ page on facebook to give correct verdicts of Bhai’s & SRK’s movies. MAMk was a ATBB & CE was disasaster. Bhai Roxx!! Krissh 3 and Chennai express were BB not ATBB as u mentioned. Where is Gadar which was the outstanding movie of last decade along with 3 idiots. Without any support of biased media, akshay kumar managed to give so many hits unlike khans who are consistently supported by biased media as they are only actors of bollywood. And by the way your list is wrong as in this period akshay kumar topped the chart of giving hit movies as he gave 21 hits according to BOI.